If power and functionality is the need of the hour, then the Alcatel Pixi 4 7 Tablet is the device for you. Cortex’s 1.3GHz Quad Core CPU and 1GB RAM, embedded in this device make sure all its features and applications operate without a hitch. The advanced tab can click stunning photos and videos with its 2MP rear camera while its VGA front facing camera does an excellent job of clicking selfies and aiding video calls. 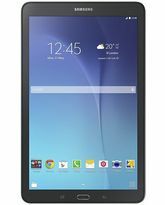 The Alcatel Pixi 4 7inch Tablet’s Wifi support 802.11 b, g, and n specification WiFi enable it to access fast Internet from virtually anywhere. An 8GB built in storage efficiently saves quite a lot of data. The sleek black color of the device perfectly complements its rounded edges and exquisite finish. The Alcatel Pixi 4 7 Tablet’s 7inch TFT screen comes enclosed in a sleek frame that is virtually borderless. The minimal frame makes the 600 x 1024 pixels images on the display appear more pronounced, thereby making your visual content a lot more immersive. The Alcatel Pixi 4 7 Tablet is just 9.2mm thin. The compact size makes it easy to hold this device in your hands or carry it in your bag. And whether you'd believe it or not, this tablet's narrow frame also hosts dual cameras. You have a 2MP rear camera that lets you snap stunning pictures characterized by lifelike detail. It records videos in 720p at the rate of 30fps. The VGA front camera garners bright and peppy looking selfies and also supplements your video calls. The Alcatel Pixi 4 7 Tablet supports 802.11 b, g, and n specification WiFi adapter. These connectivity options ensure you are connected to speedy Internet while on the move, or near wireless hotspots, respectively. The Alcatel Pixi 4 7 specs influence the device's stellar performance. They include a 1.3GHz Quad Core Cortex A7 processor and onboard 1GB RAM. These advanced internal components deliver a glitch free user experience while playing games, viewing photos and videos, and more. The device’s Android Lollipop OS v5.1 enables a smoother tab user experience along with access to handy apps. The Alcatel Pixi 4 7 Tablet features a big 7inch TFT panel touchscreen that can display images with WXGA resolution. The tablet’s high color output and pixel density enhance the quality of the pictures, making them sharp and vibrant. The Alcatel Pixi 4 7 Tablet's 8GB internal storage can save all your vital data. You can even expand the available space by adding an optional microSD card of up to 32GB. Now you can keep all your favorite and essential files with you wherever you go. If power and functionality is the need of the hour, then the Alcatel Pixi 4 7 Tablet is the device for you. Cortex’s 1.3GHz Quad Core CPU and 1GB RAM, embedded in this device make sure all its features and applications operate without a hitch. The advanced tab can click stunning photos and videos with its 2MP rear camera while its VGA front facing camera does an excellent job of clicking selfies and aiding video calls. 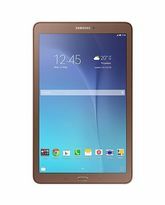 The Alcatel Pixi 4 7inch Tablet’s Wifi support 802.11 b, g, and n specification WiFi enable it to access fast Internet from virtually anywhere. An 8GB built in storage efficiently saves quite a lot of data. The sleek black color of the device perfectly complements its rounded edges and exquisite finish. XL VIEWING The Alcatel Pixi 4 7 Tablet’s 7inch TFT screen comes enclosed in a sleek frame that is virtually borderless. The minimal frame makes the 600 x 1024 pixels images on the display appear more pronounced, thereby making your visual content a lot more immersive. CAMERAS IN COMPACT CONSTRAINTS The Alcatel Pixi 4 7 Tablet is just 9.2mm thin. The compact size makes it easy to hold this device in your hands or carry it in your bag. And whether you'd believe it or not, this tablet's narrow frame also hosts dual cameras. You have a 2MP rear camera that lets you snap stunning pictures characterized by lifelike detail. It records videos in 720p at the rate of 30fps. The VGA front camera garners bright and peppy looking selfies and also supplements your video calls. SEAMLESS INTERNET CONNECTIVITY The Alcatel Pixi 4 7 Tablet supports 802.11 b, g, and n specification WiFi adapter. These connectivity options ensure you are connected to speedy Internet while on the move, or near wireless hotspots, respectively. 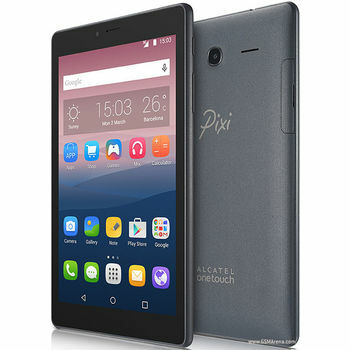 SUPERFAST PROCESSING The Alcatel Pixi 4 7 specs influence the device's stellar performance. 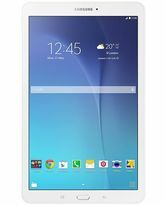 They include a 1.3GHz Quad Core Cortex A7 processor and onboard 1GB RAM. These advanced internal components deliver a glitch free user experience while playing games, viewing photos and videos, and more. The device’s Android Lollipop OS v5.1 enables a smoother tab user experience along with access to handy apps. LIFE LIKE DISPLAY The Alcatel Pixi 4 7 Tablet features a big 7inch TFT panel touchscreen that can display images with WXGA resolution. The tablet’s high color output and pixel density enhance the quality of the pictures, making them sharp and vibrant. AMPLE STORAGE The Alcatel Pixi 4 7 Tablet's 8GB internal storage can save all your vital data. You can even expand the available space by adding an optional microSD card of up to 32GB. Now you can keep all your favorite and essential files with you wherever you go.